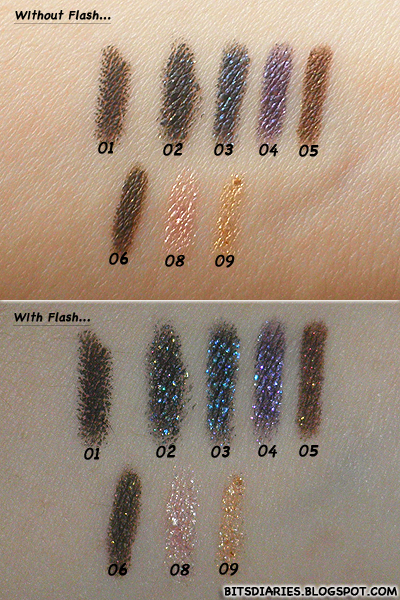 From left to right: 01 Black, 02 Black Crystal, 03 Lapis Lazuli, 04 Purple Amethyst, 05 Brown Amber, 06 Olive Peridot, 08 Pink Topaz(for undereye) and 09 18k Gold(for undereye). There are a few more colors which I did not pick it up. The colors I did not have are 07 One Carat Diamond(for undereye), 10 Chocolate Citrin, 11 Light Brown Amber, 12 Olive Jade. 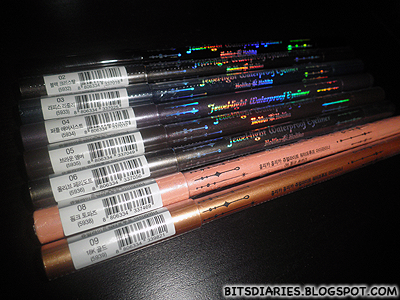 Probably I would buy the rest of the colors in the future. 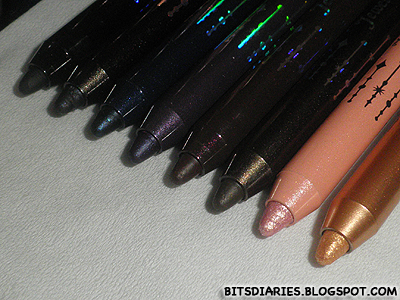 - Take some time to remove the glitter traces completely despite using makeup removal. I have a little disappointment with 06. It supposed to be Olive shade however the color looks more like a mixture of brown and black... :( As for 01, it's just an ordinary black eyeliner... So for recommendation, I would highly recommend 02, 03, 04, 05, 08 and 09.
omg are you serious?! i've been buying new ones after the top runs out! Hahaha I tried twisting the bottom several times and thought it was broken. 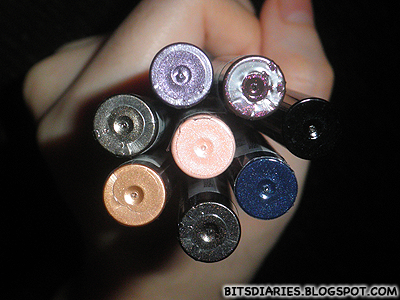 I had to search for reviews on the internet to realise it could be sharpened -_-"
OMG the color 8 is so beautiful ! Sorry for the extreme late reply... ><"
i get no 3 and 5 a year ago and apply it everyday, but then i abandon it for about 6 months because i switch to tony moly gel eyeliner. 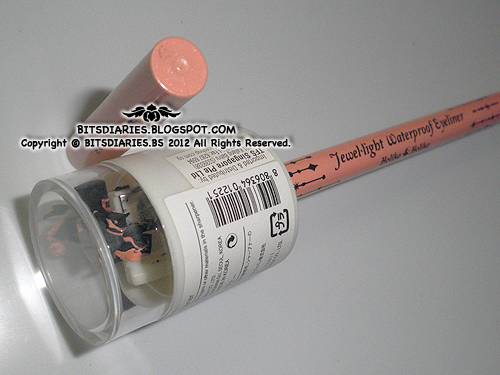 but now when i want to apply this eyeliner gets mushy and messy. it can't make a single line at all!